There’s a story that been living with me as I’ve prepared for this Sunday. It’s a story about a little boy living in a village. Every day he goes out into the woods and forest. thieves, possibly; something could happen? How would your life have been different if, when growing up, the divine had been imaged as female? “Cakes for the Queen of Heaven” is a woman-honoring adult religious education curriculum of feminist theology that examines pre-Judeo Christian cultures that worshipped the female as divine. The concepts of equality and reverence for the female in a religious setting are eye-opening to many participants. More than Goddess 101, this workshop series examines important elements of today’s women’s lives: personal, interpersonal and societal. Offering a 5 session course for women beginning on Wednesday, April 4 and running for 5 consecutive weeks from 2:00 to 4:00 pm in the Sanctuary of the Unitarian Universalist Church of Ellsworth, Maine. Facilitated by Carol Leonard. Pre-registration is required ($10 fee for materials, payable at the first class). 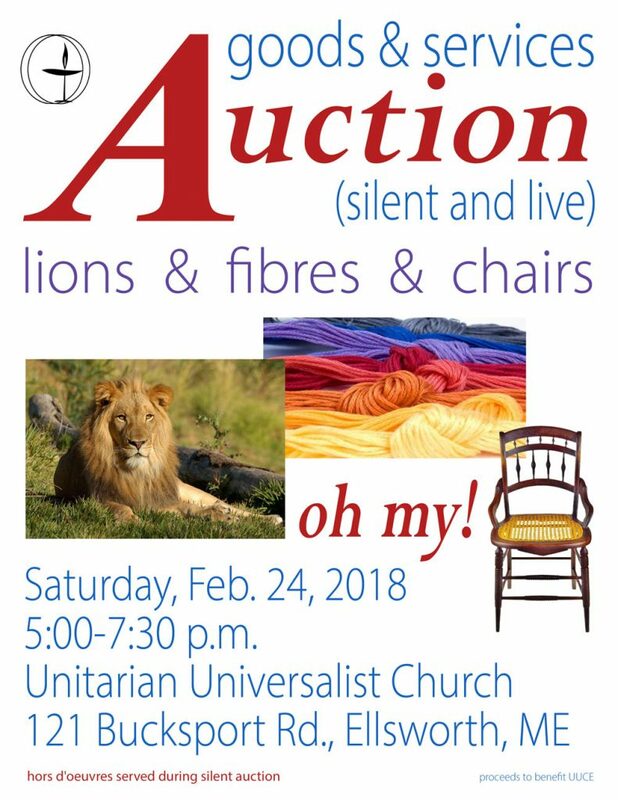 Contact Eileen at the UUCE office for more information or to register: 207-667-4393 or office@uuellsworth.org. The title for the curriculum comes from the book of Jeremiah in the Hebrew Bible wherein God speaks to Jeremiah, saying: “Do you not see what they do in the cities of Judah and in the streets of Jerusalem? The children gather wood and the fathers kindle the fire, and the women knead the dough to make cakes to the Queen of Heaven and to pour out libations to the Goddess, in order to anger me!” (Jeremiah, 7:17-18). Carol Leonard is a midwife and is the author of the best-selling memoir, Lady’s Hands, Lion’s Heart, A Midwife’s Saga, Bad Beaver Publishing, 2010. To order, go to Amazon or www.badbeaverpublishing.com. Maine All Care will be showing the film “Fix It: Healthcare at the Tipping Point” at UUCE on Friday, January 26, 2018 at 6 pm. (A snow date of February 2 is planned.) After the film, there will be a panel discussion on universal healthcare in Maine led by Hancock County healthcare providers and business leaders. Refreshments will be offered following the program. There is no charge and all are welcome. Please contact Bruce Becque at 207-667-6601 for additional information. Maine All Care is a non-partisan and non-profit organization, committed to educating the public and policy makers in Maine to improve the current healthcare system in Maine making it accessible and affordable for all. Maine All Care is dedicated to the goal of achieving universal, high quality, and affordable healthcare for all residents of Maine. Local chapters work to inform and educate our neighbors about the need to transform the current healthcare system into a state wide, publicly funded universal healthcare system. This is done through community health forums, guided discussions, film screenings, and other community sponsored events. There are currently nine active chapters in Maine. The Unitarian Universalist Church of Ellsworth (UUCE) and MaineTransNet (MTN) will be co-sponsoring a workshop on Friday, February 9 (snow date: Friday, February 16), from 6:00 to 8:00pm entitled “Tour for Trans Allies” at UUCE at 121 Bucksport Rd., Ellsworth. This program is free. For additional information, please email: Quinn Gormley at quinn@mainetransnet.org. The program will address: terminology, gender theory, and use of pronouns. There also will be a discussion on the “Pillars of Allyship”: five ways to support friends and the local trans community. The “tour” will bring this training, along with a panel of local trans people, to all 16 counties in the state of Maine at least once. MaineTransNet facilitates peer support groups for trans people and allies in addition to providing avenues for social networking and public dialogue. MTN directs people to available resources and provides training and education opportunities. With the transgender community expanding rapidly in a politically hostile environment, MaineTransNet is working to generate as many allies as possible in every corner of Maine. The transgender community is strongest when supported by many friends, and individual trans people are more likely to thrive when the people in their lives know how support them. Tour for Trans Allies sponsored by the Unitarian Universalist Church of Ellsworth and Maine TransNet. This program is free. For additional information, please email: Quinn Gormley at quinn@mainetransnet.org. Religion and society are in constant flux, interacting as partners dancing in spirals. Some religious and social movements are ponderous while others take dramatic and even violent leaps. Music provides us with a lens into the maelstrom of change, measuring progress, provoking action, giving solace and building unanimity. We will think and sing about music and social change. On this Easter Sunday, in most Christian churches around the world, people celebrate the bodily resurrection of Jesus as Christ. How do we, 21st century Unitarian Universalists, enter into this story? Where does resurrection happen in our lives & the world? What if all the skeptics are off track and all the atheists are wrong, and there is a god, or gods? What if that god is really a god who listens, a god who responds, a god who hears and is heard? What kind of god would you have, if you had a god? What kind would you claim? Where would you find your god, or gods? Would you lie with them, sleep with them, eat with them? Would you argue with them? Would you have fireside chats? Where would you find them, or where would they find you? If there were a god or gods, and if you could choose, what kind would suit you best? Fiddler On The Roof’s Tevya likes to pace, and shout and shake his fist at the sky; Mary Oliver goes walking; more than one biologist has found god at the end of a microscope; in the movie Contact, Jodi Foster’s character finds something so beautiful it brings her to tears on her way to another universe. As humans we have been seeking the divine for thousands of years; what we have found has filled volumes, transformed careers, caused the rise and fall of empires. We all crave contact with the divine. We all want to be united with that which is precious, special, delightful, holy. How we understand that divinity varies, and ways to encounter the divine are almost limitless. Who would we be without each other? Would we be lonely? Would we be sad? Would we be finally, totally at peace? Some of us are clearly more externally-oriented than others. But humans are made to be social. We are made to live among each other, to laugh and cry together, to love and fight and heal in unending circles of days and months and years. No matter how introverted we are, there is a basic human need for each other; without touch, without companions, infants die and adults go insane. We are made for contact: challenging contact, intimate contact, creative contact, religious contact.